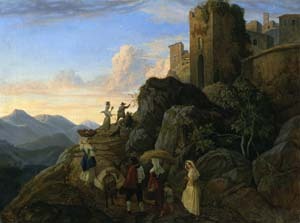 Civitella (Evening) (1827 - 1828). Adrian Ludwig Richter (Dresden, 1803 - Dresden, 1884), the son of the engraver Karl August Richter, from whom he received his training, was a German Romantic painter, typical German illustrator and etcher. His etchings were used too for illustrations for popular books and children's books. Richter painting is aimed at a thorough blending of the human figures with the landscape, and to glorify his mother country. The abandonment in the forrest, 1842. My Nest is the best, 1869. Genoveva in the Forest Seclusion, 1841. This page was last modified on 26 September 2018, at 08:05. This page has been accessed 6,707 times.